Tech-Wonders.com » Google » What is Google Pack? Google Pack was introduced by Google on January 6 at the 2006 Consumer Electronics Show. It is a software package specifically selected by Google that offers the user to discover, maintain and install a wide range of applications. At present Google Pack is available only on Vista and Windows XP. 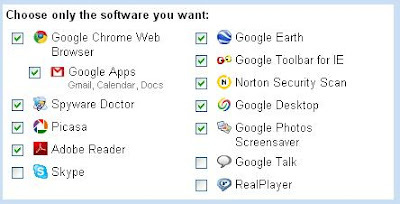 There are various application programs a user can choose from, while installing Google Pack. The software applications which are available differ on the base of the language and locale the user has selected. The U.S Windows XP version of this pack provides a variety of applications which include Google Earth, Google Desktop, Google Chrome, Google Talk, Google Video Player and Google toolbar. At times Google Pack also features Spyware Doctor, Adobe Reader 8, Skype and Norton Security scan. The list of third party varies from time to time. This amazing software comes along with Google Updater which acts as a package management system to help in installing, downloading, removing and automatically updating Google Pack’s applications. The user can browse the web faster with the help of Google Pack. It also helps to remove spyware and viruses and other dangerous threats. It is very easy to download Google Pack and the user can install the entire pack in just few clicks without wasting much time. Google Pack is smart and superb software which offers various applications free of cost. It helps the user to keep their computer organized and updated with necessary applications at their fingertips. Thus Google Pack applications provide the users with interface environment ideal for computing.